The San Luis Obispo County District Attorney’s Office is filing an additional charge of felony involuntary manslaughter against the former Grover Beach police officer whose dogs attacked and killed a 64-year-old Grover Beach man. Alex Geiger, 25, already faces two felony counts of owning a dog trained to attack while failing to exercise ordinary care, which could land the former officer up to three years and eight months in prison. Geiger is not facing any additional prison time as a result of the new charge. Prosecutors, though, were seeking more angles on which they can try and convict Geiger. During a preliminary hearing Monday, Deputy District Attorney Stephen Wagner filed a motion to amend the criminal complaint against Geiger so that it would include the involuntary manslaughter charge. On Dec. 12, Geiger’s two dogs chewed through a fence and attacked Betty Long, 85, in her front yard. Long’s neighbor, David Fear, went to assist the woman, and Geiger’s Belgian Malinois and German Shepherd turned their aggression on Fear. Fear died shortly after the brutal attack. Long survived the attack with a broken pelvis and a broken shoulder. She returned home earlier this year after undergoing a shoulder replacement and spending time in a rehab facility. San Luis Obispo County Animal Services personnel euthanized the Belgian Malinois on the day of the attack. Animal services personnel let Geiger keep the German Shepherd, but then removed it from Geiger’s custody after CalCoastNews reported that both dogs participated in the attack. 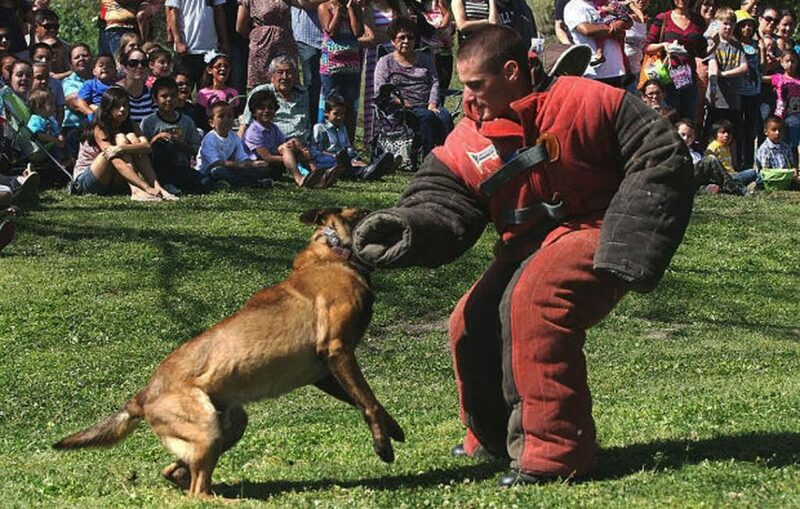 The Belgian Malinois, which was a former police K-9 that Geiger handled as an officer in the Central Valley, was the more aggressive dog. The dog was Geiger’s personal pet at the time of the attack, though the officer had been lobbying the Grover Beach Police Department to launch a K-9 unit. Last September, Geiger purchased the Belgian Malinois, Neo, from the Exeter Police Department for $5,287.50 and brought it to Grover Beach. Sources from within the Exeter Police Department told CalCoastNews that Neo had some training and behavioral issues. Shortly after Geiger moved into his Grover Beach home, his neighbors began having issues with the dogs. Neighbors said the dogs were left unattended for long periods of time, and they would try to break through the fence while angrily barking. On Monday, Geiger appeared in court, but a judge continued the preliminary hearing after prosecutors moved to amend their complaint. The prosecution must now prove it has enough evidence for the case to go to trial. So a man is mauled to death (just think about how horrific that would be) and a woman sustains life-threatening injuries…yet it took SIX MONTHS for an involuntary manslaughter charge? What on earth took so long, Dan Dow? Typical above the law for cops. If his dog killed my wife, his charges would be the least of his problems. Let’s see… you’re 100% responsible for someone’s death and another person’s significant suffering, and the worst you can get is less than four years in prison? No extra prison time for the new charge? Why bother charging him then? I can’t help but think that if the guy was other than white and other than a police officer, he would be getting charges that better fit the damage and suffering he was responsible for. It will be a miracle if this guy spends even a single day in prison. As I have read the victims stated “the dogs are eating us” Where it is true that help arrived for them. But Mr.fear is dead.Mrs.long injured and traumatized by a event that “NEVER” should have occured. I have no pity or rescue for thus so called officer.I do commend the DA that is willing to serve justice. Thank you Mr.DA and rest in peace Mr.fear and BEST wishes to Mrs.long. My first thought is finally one of the special people being held accountable for their actions but we must wait for the conclusion, a lot can happen until/if there is a trial, conviction and a sentence, such that a regular person would get, not a special person. I have to wonder who twisted D.A. Dow’s arm, he never would have filed this charge on his own? He is a 25 year old, newly transferred / hired officer, from Exciter. He’s not one of the special people. More like red meat to satisfy the lions. No one is coming to his rescue. Is there any malice or intent alleged that would cause this to be upgraded in such a manner? Negligence is all that we’ve been made aware of thus far. Which the initial charges covered just fine. So you seem to agree that negligent homicide is a fitting charge, correct? Of course, a jury will have to decide whether he was negligent. I believe negligence would be a component of every charge he faces. But why the late upgrade and additional charging? Don’t you want to be comfortable that the prosecutor’s office is making an appropriate charge and not politically motivated ones? Proof that he isn’t a “special one” for sure. = Reason for original reply. And also indicative of a “spaghetti” prosecution —throw what you can at the wall to see what may stick. = Reason to be appalled by our Justice system’s unequal application of the law. Overwhelm the under-represented with charges is by design. This guy is not special by any means ( he wasn’t in the club long enough), but you should be just as concerned that he may be over-charged because of who he “is” just as much as some are concerned that he would be under charged for being “special”. Being special can bite both ways. In this instance an argument could be made that there is a political motive to come down hard on an allegedly negligent cop.—–hence tossing to the lions. Unequal application of the law is the issue. Juries are often asked to decide cases in which the defendant did not have the equal application of the law afforded to them. Last minute charges smack of being politically motivated to me. Perhaps to ensure that he doesn’t serve even less time? I understand the intent of the move by the DA….not the timing. Why wait until the last minute?